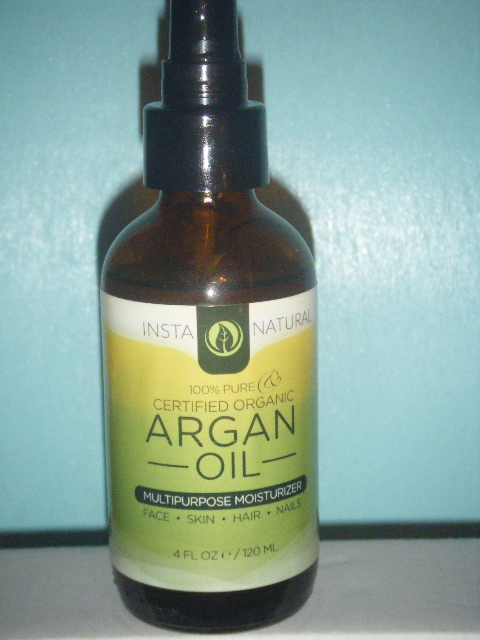 InstaNatural’s Moroccan Rose Water, Hyaluronic Acid Serum, & Argan Oil Product Reviews. Like many of you I love to try new skin care products. Of course the selection of products seems endless! Normally I like to use more natural based products. The demand for natural based skin care products seems to grow, and grow. Truthfully the selection process can be a bit daunting. I do love trying new products, and when you try lots of things it’s easier to find what you love. While the aforementioned is true there are many not so good products on the market. Personally I love the products from Instanatural. They have a great selection of products to care for your face, hair, and body. In this blog would like to focus on three products. * 100% Pure Moroccan Rose Water*: In the past I thought that using a facial toner was a needless step in skin care. Some toners I just never cared for, and it was not an enjoyable step in my skin care routine. 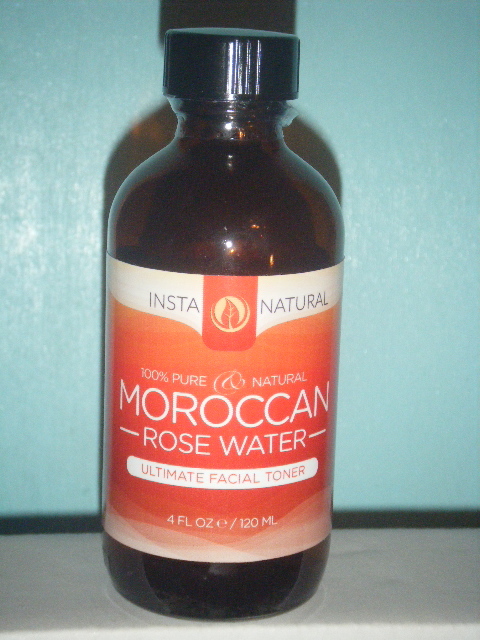 Been using InstaNatural’s 100% Pure Moroccan Rose Water Facial toner. Love this toner for many reasons. First love the scent, and it is divine. It is an effective toner that does not dry out your skin or burn either. Simply take a cotton ball on top of the bottle, and wet the cotton ball. Light pat the toner onto my face. While you can smell the rose scent it does not overpower. It gentle tones, and hydrates the skin. It quickly absorbs into your skin, and it’s a sensory experience. Have even used this toner in my bath water to relax my mind. Currently you can find the Moroccan Rose Water on amazon for 13.97. Here is a direct link to the product http://goo.gl/2BYBAZ think you shall enjoy this product. * Hyaluronic Acid Serum * : After using my facial toner I follow with a serum. 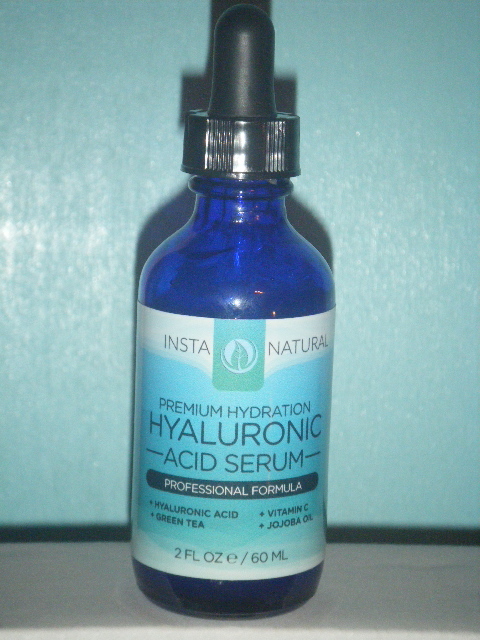 InstaNatural makes an amazing Hyaluronic Acid Serum. Love this product for many reasons. Most important reason is it works at plumping up my skin & hydrating also. Yes there are many hyaluronic acid serums on the market. Instanatural’s is the best I have used. It stands out because of it’s ingredients. Just a few of it’s key ingredients are green tea, jojoba oil, vitamin c, and of course Hyaluronic Acid. This product has many anti-oxidants which help to give you a more youthful appearance. Love knowing that I am not putting toxic chemicals on my skin. This serum has given my skin tone a more even tone. I no longer have those flakey patches on my face. In the past had bad dry flakes around my nose, but no longer. My skin is hydrated, and glows! Currently you can find this serum for 16.45$ on Amazon, and here is the direct link http://goo.gl/ZLf76o hope all of you try it. * 100$ Pure Argan Oil * : Argan oil is very popular currently. To be honest it can be hard to choose a good Argan Oil. Not all Argan oil’s are created equal. Many products are mixtures of oil’s and often the percent of argan oil used if very small. Instanatural’s 100% Pure Argan oil has one ingredient… Argan Oil! Instanatural’s Argan Oil is 100% pure. It is also cold pressed which means it has all of it’s omega fatty acids. Our bodies do not produce omega fatty acids. Normally we get this from fish, and some nuts. Love Instanatural’s Argan Oil as it can be used in many ways. I have used it as a moisturizer for my face, and body. Use it on my hair, and nails also. I take few drops and gently pat the oil into my skin. Take your time, and just enjoy the process. I have noticed that the fine lines on sides of my eyes have softened. My skin looks hydrated. My skin is combination, and often my forehead looks oil. From using this argan oil my skin is balanced, and does not look or feel oil. In the past I used products that stripped my skin making my oil glands over produced. 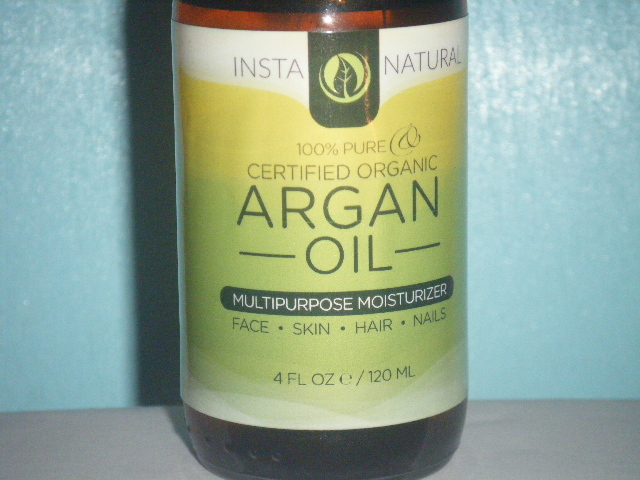 If you have oily skin… a natural oil such as Instanatural’s Argan Oil could balance that out. The current price is 17.47 on amazon here is the link http://goo.gl/6JjtNJ your going to love it. Love Instanatural’s products. It has a wide range of products. Many of their products are made in the USA, and believe all are cruelty free. Personally I want to spend my money with a company that does not test on animals. Yet another positive aspect is that it’s employing other American’s. The customer service is excellent! When you purchase items they send you a great tip sheet for that product. Normally I interact with an awesome lady named Melissa via emails. Here is a link to Instanatural’s homepage http://instanatural.com/ check out their range or products. These products were sent to me for free in exchange for an honest review. These are my thoughts about the products used. Instanatural allows me to use the products, and share my true feelings. Listen I am not a professional writer, and these are my thoughts & feelings. When I love product…. I love them! Now if I do not like a product I shall speak the truth. If you have any questions please comment on this post, and shall get back to you as soon I can. 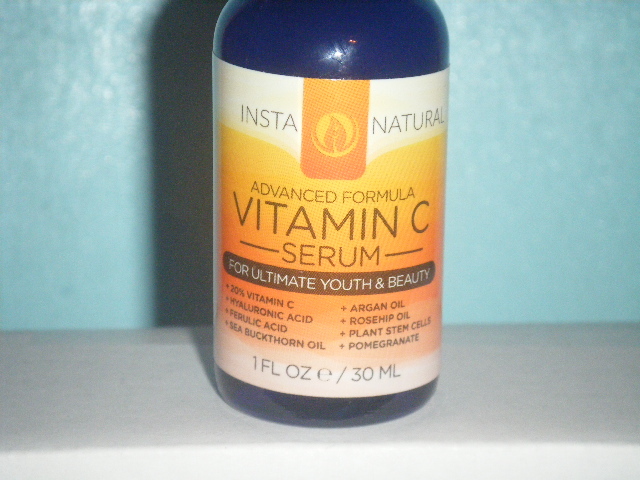 Instanatural’s Vitamin C Toner, Serum & Youth Express Eye Gel Reviews. I have been lucky to try & review some awesome products from InstaNatural’s. Today I am back with some new product reviews. In this blog shall review the Vitamin C Facial Toner, Vitamin C Serum, and the Youth Express Eye Gel. Like to start out with Instanatural’s Vitamin C Tone. Yes I am a skin care junky! Honestly had stop using toners as thought they were a needless step. Many of the past toner’s seemed to harsh or not for someone like myself. 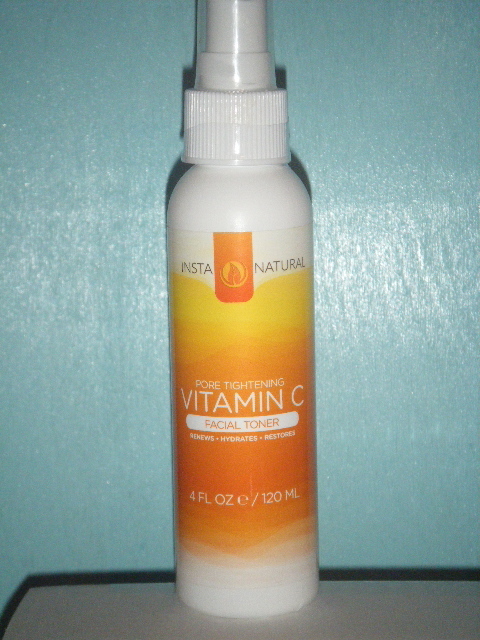 Love InstaNatural’s Vitamin C Toner. It has nice faint citrus or orange like scent. Toner’s are often used to help tighten pores, and refresh the skin. Some toner’s also dry out the skin. InstaNatural’s Vitamin C toner helps to purify your skin, and make pores appear smaller. I feel that this toner also hydrates the skin also. This toner makes my skin feel refreshed & new. Yet another positive about this toner is that it’s in a spray bottle. I like to spray it on my face & neck, and simply allow it to dry. Love that don’t need any sort of cotton balls, but you can do that if you choose. As said earlier it also has clean, fresh citrus scent. This toner is infused with Vitamin C which has anti-aging properties. I also tend to mist the toner on my face when my skin needs a pick me up. 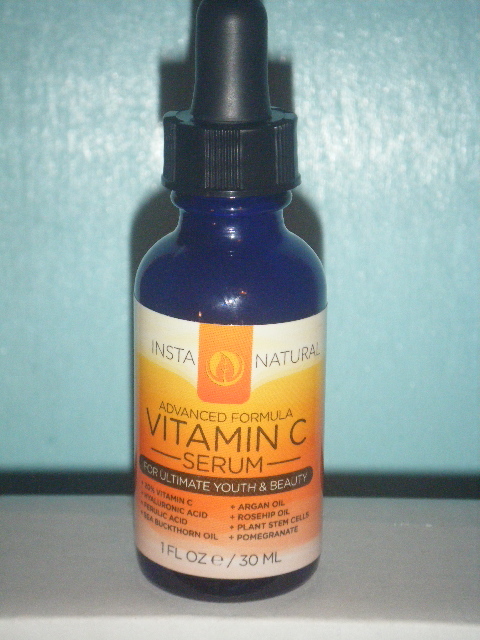 Next product love to share is InstaNatural’s Vitamin C Serum. Now InstaNatural has many awesome products, and you can mix & match if you wish. I love using the Vitamin C serum along with the toner. This serum also has that orange scent. It also has a slight orange/yellow hue to it It’s also rich, and thick. While it is thick it’s not heavy or sticky. It absorbs quickly. This serum adds a brilliant glow to my skin. I feel my skin looks hydrated & appears soft. My skin no longer has a rough look to it! The Vitamin C also helps to plump up my skin. Few of the powerhouse ingredients are rosehip seed oil, algae extract, pink grapefruit, green tea extract. Of course it also has Vitamin C in it. I need only few drops to cover my face & neck. Love the scent of this serum it just relaxes me as I use it. Think this serum will have my skin looking amazing all winter long. If you don’t use your serum faithfully… you will not see results. After the first use my skin looked dewy & hydrated all day long. My skin looks younger, & healthy! 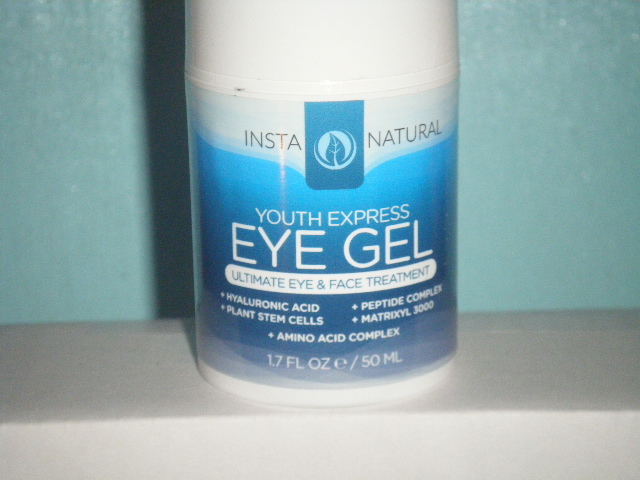 My favorite eye product is InstaNatural’s Youth Express Eye Gel. This eye gel is great for puffiness under the eyes. Love that this gel is in a pump. I lightly tap the pump to dispense the gel. Only down side is sometimes it puts out to much of the gel. Still no problem as I also put the eye gel on my eye lid. A few of the key ingredients are hyaluronic acid, peptide complex, & matrixyl 3000. This eye gel also has organic aloe in it which soothes the eye area. 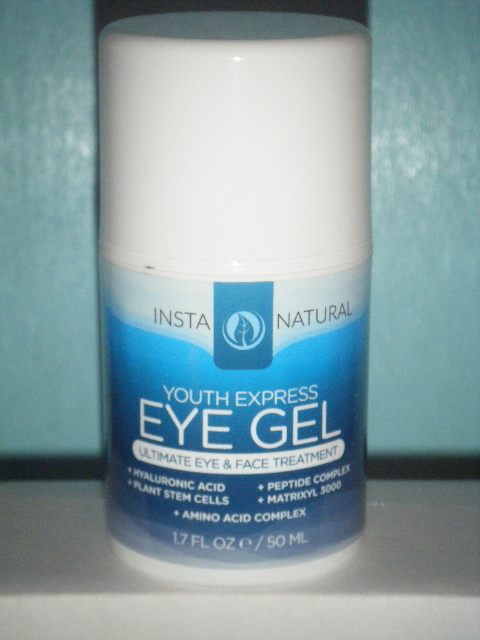 Since using Instanatural’s Youth Express Eye Gel my upper eye lids no longer look crepey or dehydrated. The dark circles are no longer an issue. Since this eye gel is 100% natural it’s safe to use all over the eye area. It goes on smoothly, and is effective without causing burning or pain. Love that! I am a big Instanatural fan. All of the products are cruelty free. Many of Instanatural’s products are made in the usa. Another aspect is the customer service. Instanatural want’s you to be happy, and they send useful information on how to achieve maximum results. Let’s be honest no product will work unless you faithfully use it. Good skin can be achieved if you put in the work, and using Instanatural’s products help me to look & feel better. Thanks for reading & stay blessed! a review on two products. The manufacture is InstaNatural. The products are Argan Oil Hair Mask & Youth Express Age-Defying Moisturizer. 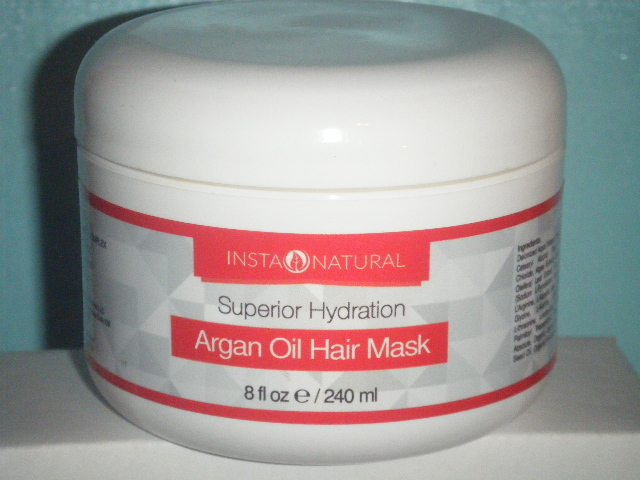 InstaNatural’s Argan Oil Hair Mask is a deep conditioning treatment for dehydrated & stressed hair. It also helps to bring back shine & strength to the hair. Organic Argan Oil is the 3rd ingredient listed & so it has that as a main ingredient. Few other important ingredients in this product are amino acid complex, coconut oil, shea butter, and vitamin B5. This hair mask has an amazing scent. While a beautiful scented product is nice what it does for your hair is more important. My hair texture is very thick & curly, and can often be dry. While my hair is fairly healthy it does often lack moisture & shine. This mask is able to hydrate your hair, but doesn’t leave it heavy or weighed down. If you look at the photo above the hair mask is pale tan color. It’s very thick & creamy texture. When using this mask would suggest adding it to damp hair, and not soaking wet hair. Start off by working it in from the scalp to the ends. Would also suggest using wide toothed comb to even distribute the product. With InstaNatural Argan Hair mask a little goes along way. 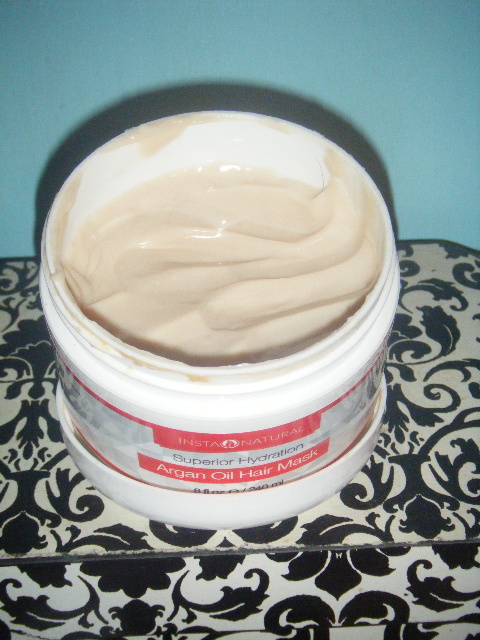 This is an intensive moisturizing hair mask. Would suggest using it twice a week. InstaNatural suggest leaving the product in for 15 minutes, but I leave it in for a few hours. After rinsing out my hair my hair is much easier to manage. I can easily comb my hair, and my hair has shiny to it. Normally my hair looks dry. Have noticed that my scalp feels moister, and have less issues with itching or dandruff flakes. This product comes in an 8oz plastic jar, and for my hair need about 1 tablespoon. Would suggest that you experiment for the correct amount for your hair. This product is made in the USA, and not tested on Animals. 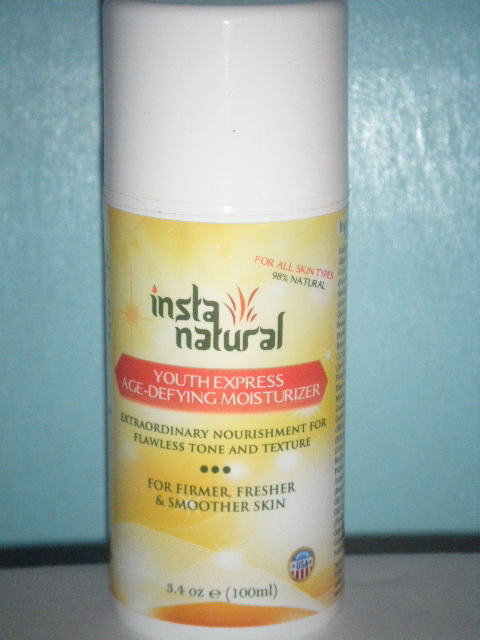 Now onto InstaNatural’s Youth Express Age-Defying Moisturizer. First thing that I love is that this product 98% natural. Just a few of the ingredients are coconut oil, rosehip oil, jojoba oil, and many of the ingredients are organic. This lightly scented moisturizer is white, and creamy looking. It absorbs quickly. Like that it does not leave my skin looking oily unlike other products on the market. Yes I want to be moisturized, but not look oily or wet. This product does leave my face looking moisturized, and it’s not sticky. Like that my skin texture looks smoother, and firmer also. This product is fine for all skin types. Just a bit of advice now. This product does have an alpha hydroxy acid, and would suggest to wear a sunscreen for daytime use. I personally did not experience any sensitivity issues. Have enjoyed using both products. I LOVE the Argan Oil Hair Mask as my hair looks so much better now. That mask is just a hero product, and if you have curly hair… get this Argan Hair mask. Would suggest going to InstaNatural’s website to see their other products… here is the link http://instanatural.com/ amazing natural products. Here is a link to the Argan Oil Hair Mask on Amazon http://goo.gl/Evoh2Q & here is a link for the Youth Express Moisturizer on amazon http://goo.gl/7SMTDy please check out the links. Once again I want to thank you for reading my blog. If you have any questions just leave a comment. Stay Blessed, and thanks for reading my blog. 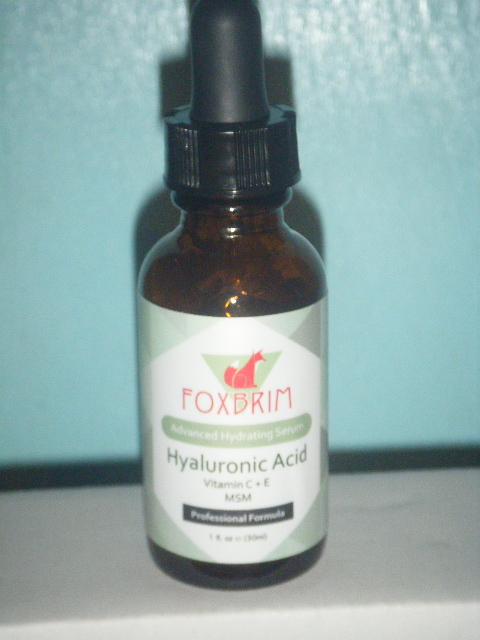 Foxbrim’s Hyaluronic Acid Serum Product Review. Over the past few weeks I have been using a new serum. The serum is a Hyaluronic Acid Serum by Foxbrim. Serums are a regular part of my daily skin care. Younger looking skin looks plump & radiant. As you get older & due to environmental factors we loose that plumpness to our skin. What is Hyaluronic Acid? It’s a natural substance found in the human body, and as you age your body produces less & less. When your body doesn’t have as much natural Hyaluronic acid the skin want’s to sag, and look dull. Recently I have been using Foxbrim’s Hyaluronic Acid Serum. With so many Hyaluronic Acid Serum’s on the market why choose Foxbrim’s? This serum has vitamins C + E and MSM. Both Vitamin’s C + E are good for your skin. Like that Foxbrim Hyaluronic Acid serum has thicker consistency, but it’s not sticky or tacky. While it’s thick it does absorb quickly. Foxbrim’s Hyaluronic Acid Serum comes in a brown 1 fl. oz bottle. I personally like that it has the vial top bottle. That way your can squeeze few drops into your hand, and not cross contaminate your serum. A serum should be applied to a clean dry face. Personally use about three generous drops of the serum, and apply it to my face & neck. Lightly pat the serum into my face & neck for about two minutes. Many people never see results from their serums as the just rub the serum on quickly. A serum needs help to absorb deep into the skin. This serum has a faint scent to it, but it’s not overpowering, and you won’t notice it after a few minutes. Like the consistency as it’s thick, but not heavy. Many serums tend to be thin like water or to heavy, but Foxbrim is perfection. This company has many excellent products, and here is a link to their homepage http://www.foxbrim.com/ you should check them out. If you go to Amazon.com you can find a 1 fl. oz bottle on sale for 19.95$, and if you have amazon prime shipping is free. It’s a great price for this effective serum. Personally I saw positive results in the first week. My skin seemed to have a fresh glow to it, and just look rested. Another positive aspect of this serum is that it does not burn or sting, and did not experience any irritation. Yes would highly recommend this product. Like the customer serviced delivered by this company. Love that it’s also made in the USA, and it’s not tested on animals. If you are interested in buying the product click the link to buy this serum http://www.amazon.com/Hyaluronic-Advanced-Antioxdiants-IMMEDIATE-Guarantee/dp/B00LALMG3W/ref=sr_1_1?ie=UTF8&qid=1412454322&sr=8-1&keywords=foxbrim+hyaluronic+acid+serum at this price point you should try it. I received one or more of the products mentioned above for free using Tomoson.com. Regardless, I only recommend products or services I use personally and believe will be good for my readers. Thanks for reading and stay blessed. Apothecary Extract’s 100% Pure Tea Tree Oil: One Product multiple uses. What is Tea Tree Oil? Well Tea Tree Oil comes from the leaves of the Tea Tree which is native to Australia. Australia’s Aboriginals have long known the healing aspects of Tea Tree Oil. This amazing product can be used for so many uses. Normally it’s used for it’s antifungal, antibiotic, & it’s antiseptic qualities. Many people also use it for cleaning, and many other uses. So Tea Tree Oil sounds pretty awesome right? Well it is an amazing product, but not all Tea Tree Oil’s are created equal. 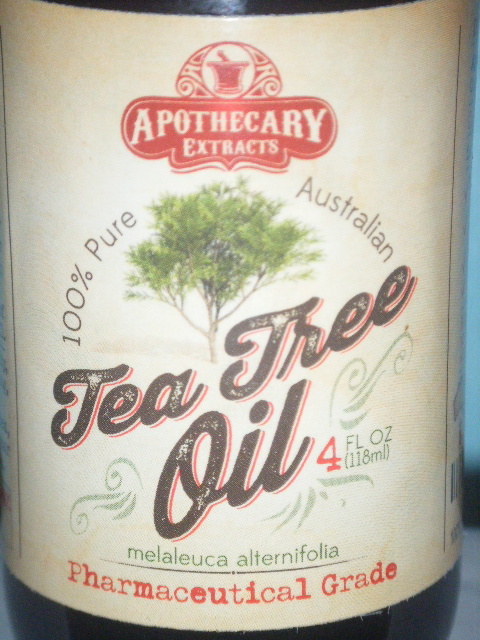 I have been a long time user of Tea Tree Oil, and recently found an exceptional Tea Tree Oil from Apothecary Extract’s. Like Apothecary Extract’s Tea Tree Oil because it is 100% pure. This is a product of Australia, but it is bottled in the USA. It’s important to know that Apothecary Extract’s Tea Tree Oil is a pharmaceutical grade oil, and so it’s highly effective. 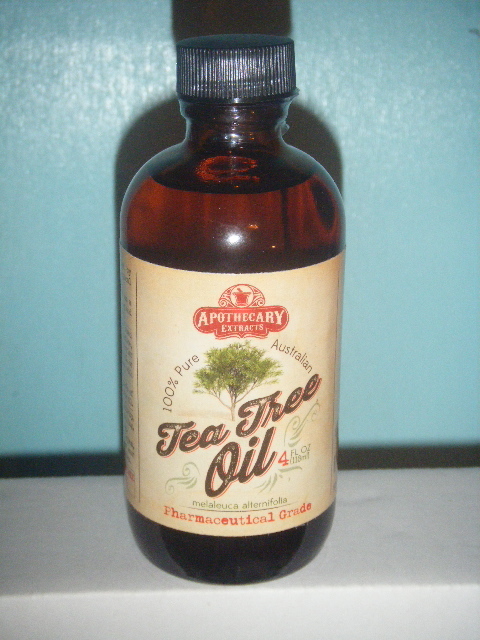 This Tea Tree Oil is sold in a dark brown 4oz bottle, and this will last you a very long time. So maybe your confused, about how to use Apothecary Extract’s Tea Tree Oil, but have no fear. With every purchase of this Tea Tree Oil the buyer receives an ebook with 50+ uses. Would highly recommend printing out this book or saving it to your computer. I personally printed mine out. I have some hair, and scalp issues! Often my scalp is very tight, and itchy. Yet another issues is dandruff. Oh yeah I tend to have dandruff, and it’s big ugly flakes. Found it highly embarrassing. In past have used Tea Tree Oil shampoos, but they did nothing for my hair. Have used Apothecary Extract’s Tea Tree Oil in several ways to help with my scalp issues. # Mixed equal parts Tea Tree Oil & Sweet Almond Oil, and applied directly to my scalp, and slept with it on my scalp over night. The next morning I rinsed out the oils, and washed my hair. Noticed after first use that my scalp was less tight, and less itchy. # Use a sulfate free shampoo, and mixed about 4 drops of Apothecary Extract’s 100% Pure Tea Tree Oil, and washed my hair. Would suggest leaving the shampoo with the oils in your hair for few minutes, and finally rinses. Now not all of my dandruff issues are gone, but it’s greatly improved. Think with bit more time my dandruff issues shall be a thing of the past. # Take an old spray bottle, and fill it up with distilled water, and add about 8 drops of Apothecary Extracts Tea Tree oil, and 3 drops of Sweet Orange Oil. This can be used as multi-use cleaner. Like using this as a house cleanser as it’s all natural. Try using this mixture to clean your shower, and shower curtain. # Use 6 drops of Tea Tree Oil, and any green dishwashing soap into your dishwashing machine to get it really clean. If you have never used Tea Tree Oil before would highly suggest doing a skin patch test. Really there is no end to the many uses of Apothecary Extract’s Tea Tree Oil. Now I do wish they had a dropper with the bottle as it would be much easier to use, and that only negative. If you have any questions go to http://www.apothecaryextracts.com/ on their website you can find other products & guidance. If you wish to purchase Apothecary Extract’s 100% Pure Tea Tree Oil click on this link http://www.amazon.com/Australian-Potency-Aromatherapy-Household-Cleaning/dp/B00GF1NZLY/ie=UTF8?m=ATVPDKIKX0DER&keywords=tea+tree+oil honestly it’s a great price point for this quality Tea Tree Oil. Did receive a free sample in exchange for my honest thoughts, and feelings. In this blog post I am expressing what this product did for me in my life. If you have any questions please comment on this post, and try to reply asap. Thanks so much for reading this, and stay blessed.